Beacon Dance Beat plays a wide array of dance music mostly from the ’60s to present with emphasis on soul, R&B, funk and all Latin rhythmic styles. Our song list, which is ever-expanding, also includes blues, reggae, calypso, disco, rock, swing, Afro-Latin, jazz, gospel, international and much more, always aiming for the music to be moving, exciting and beautiful. Producer DJ Rhoda Averbach and DJ Al Brandonisi also welcome requests. Beacon Dance Beat began organizing and hosting monthly dances in 2012 at the Howland Cultural Center in Beacon where, for more than three years, this event brought people together from all over Dutchess County and provided a place of friendship and enjoyment in the community. 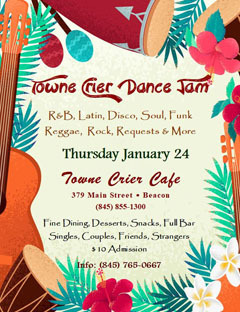 In early 2016 they moved to their new home at the beautiful Towne Crier Café in Beacon.